Why does Somatic Cell matter to a dairy farmer? Somatic cell testing is an economical tool to provide dairy farmers (whether one cow or 10,000) with measurable monitoring records of a cow’s udder health. High somatic cell is an indicator of infection and often sub-clinical mastitis can be diagnosed earlier by recognizing high numbers on a routine test. High somatic cell count can damage milk secreting tissue and reduce milk production ability in the udder. SCC (Somatic Cell Count) – Somatic Cells are white blood cells, mostly leukocytes, that are an indicator of infection. (The higher the number, the more the body’s defense system is attacking some sort of infection.) Most often written as thousands (-,000). For example: if you see “45″ it really means 45,000 somatic cells per ml. 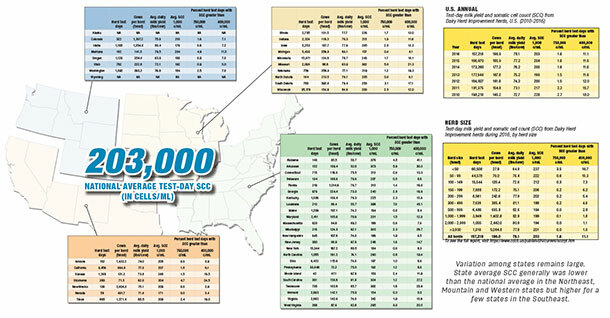 In general, SCC below 200 (200,000) is considered healthy. Notice the record (to the right). The cow was healthy on her first test (45/2) and then jumped (966/6). She showed no outward signs of mastitis, but obviously had some sort of health issue flare up that should be addressed. A count over 1 million should be diagnosed immediately through bacterial culturing. Counts above 500+ should be monitored and considered for further diagnostics. SCS (Somatic Cell Score) is a number from zero + and takes the SCC and puts them into ranges from low to high. For example: next to the “45” under SCC is “2” for SCS. A count of 4 or less is considered healthy. Counts 6 or higher should be considered for further diagnostics. Often, late in lactation when a cow has been milking 9+ months, her somatic cell may rise significantly. It should still be in the “healthy” range (under 250k-ish) but may be a lot higher than the cow normally tests. How can I get a test done for my cow? State DHIA labs test routinely for Somatic Cell. For dairy farmers with less than 10 cows, monthly herd monitoring through DHIA can be fairly expensive. For those with only a few cows or less, we recommend sending off your own samples to a lab. An example of a lab that tests for somatic cell is Washington State DHIA in Burlington, Washington. I looked on their website and emailed their lab. The lab returned my email to let me know that (as of Oct 2017) each test cost $1 and they asked if I needed tubes. I sent them my physical shipping address and soon received several collection tubes (the large kind with preservative). On a Monday morning, we prepped our cow for normal milking. I labeled each tube – one for each quarter and one for a bulk sample. Then, we squirted out several squirts of milk from each quarter into a strip cup, then filled one tube with one quarter’s milk. We put the milking machine on and milked out the cow. The completed milking got stirred, then we filled the last tube with a “bulk” tank sample. (A one cow bulk tank!) On a sheet of paper with my contact information, I listed what was in each tube and that the cow was an almost dry cow. I placed each tube in the fridge to cool, then put each tube in a ziplock bag, wrapped with protective wrap, placed in a small priority mail shipping box and a small ice pack. Mailed it out Monday and received results Wednesday afternoon by email. Be sure to read online instructions or call the lab before sending samples, so the samples are not collected with contaminants. CLICK HERE for more information on milk testing and laboratories. Is Somatic Cell testing different than testing milk for bacteria? SCC is a concrete indicator of udder health and, in our opinion, is the most useful milk testing tool for monitoring general udder health. Somatic cell readings can vary over time and lactations. This is fine, it’s more important to monitor for extremes – like going from a average of 50 to a reading of 1,000 (meaning, one million). This test was taken just before we dried off our cow (she was giving less than a gallon a day at this point!) We wanted to check her somatic cell count to know whether any dry cow treatments would be proper/necessary. LR – Left rear quarter that was shy, meaning it does not produce much milk. Tank – a bulk test taken from the milking bucket after milking out the cow. We stirred the milk a bit, then filled a sample bottle. The results were about what we expected. Her overall count was in the 250 range (higher than one would want, but realistic for an almost dry cow). We were glad we also tested each quarter individually, so that we could see her SCC was raised by the one quarter that was almost 500 SCC, which means we definitely need to treat that quarter, if not all of them, when we dry off the cow. When we dried off Rosebud, we simply dry treated her with one tube of Tomorrow in each working quarter. We do not routinely dry treat, but last dry period Rosebud got a case of mastitis while dry. We wanted to be extra cautious this year, seeing as she was also getting older (age 13 at the time). As you can see, the SCC change is amazing! 11,000 count is similar to what she had as a 2 year old! Her milk tastes amazing and she has been very healthy so far in this lactation. (Ignore the individual sample butterfat counts – we sampled the individual quarters at the beginning of milking, after a few squirts are discarded. Butterfat count is lowest in the first milk. The “bulk” test should be accurate. As seen above, Rosebud was testing low, for her, but within a month or so later, she was back to normal butterfat and protein levels and they will continue to increase as she gets further in her lactation.